The other night, I had guests over for homemade pizza. The next day, I had some pizza dough left over, as well as extra cheese and toppings, so I decided to experiment with something new: individual-sized pizzas made in a muffin tin. These mini pizzas are super cute – I’m not going to lie. Almost like little pizza cups or pizza muffins. And while they were cute, they were substantial enough to remind me of deep-dish pizza. Absolutely delicious. These mini-pizzas are really cheap. As an added bonus, this recipe allows you to use up extra ingredients you already have on hand. Who doesn’t love a good fridge clean-out? I bought Trader Joe’s fresh pizza dough (a steal at $1.29 a bag), which was enough for one medium pizza last night, and a six of these mini pizzas. All in all, each mini pizza cost approximately 30 cents. Roll out dough to make a five-inch circle. Place in greased muffin tin, fill with toppings, and bake. Another great thing about these pizzas is the option to customize each one. It’s impossible to get several people to agree on one type of pizza – whether you’re at home or at a restaurant. With these pizzas, everyone is a winner. New to Cheap Recipe Blog? Get updates, new recipes, and other fun stuff by liking my Facebook page. No spam, no nonsense. I promise! Get creative with your sauce, toppings and cheese. I filled mine with tomato sauce, mushrooms, tomatoes, jalapeños, and mozzarella cheese. These pizzas are highly adaptable. Preheat oven to 400F. Take a golf-ball sized portion of pizza dough. On a floured surface, roll out until the dough is about five inches across. Repeat with remaining dough. 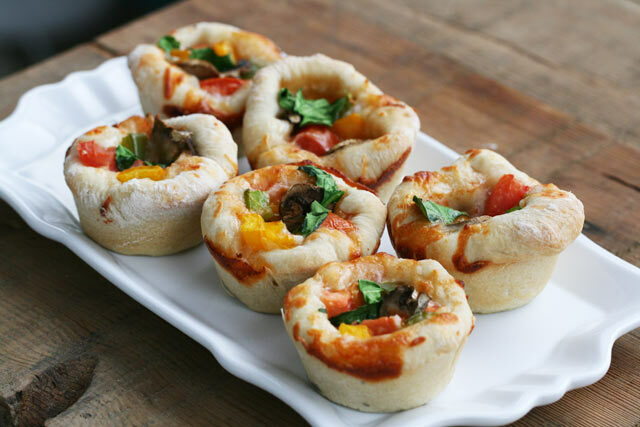 Place pizza dough rounds into a muffin tin coated with olive oil. It's okay if the dough extends above the top of the muffin tin. Put pizza sauce in the bottom of the cup. Fill with desired toppings and top with cheese. Bake for 15 to 20 minutes, or until tops are golden brown. Ooh, these look fun. I think I’ll try them for my kid’s b-day party! What a cute idea — especially for an appetizer.